We are a leading Manufacturer of vertical reciprocating conveyor (vrc), truck loading conveyor, telescopic conveyor and baggage conveyor from Mumbai, India. 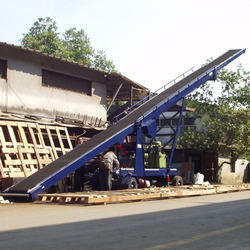 Vertical Reciprocating Conveyor (VRC), like other types of lifts or conveyor, which are used to provide a more efficient movement & storage of material within a manufacturing, retail, wholesale, or distribution facility – especially where one or more overhead storage or process areas are utilized. VRCs can be operated automatically or manually, and are available in a wide variety of lifting capacities up to 10 tons, at height of 25m, and compatibilities for virtually any operating environment (outdoor, explosion-proof, clean room, low or high temperatures, etc.). 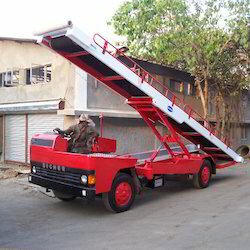 The Truck Loading Conveyor is useful for simple tasks like unloading or loading trucks and taking it to the first floor or plainly to move the material to any places where material needs to be moved rapidly and efficiently. NANDAN's ranges of truck loading conveyors are available with hydraulic inclination height ranging system and telescopic arrangement to suite Loading & Unloading in Trucks & Containers. NANDAN’s Telescopic Conveyor can not only be used in loading bays, shipping or dock areas but also as a conveyor based on the requirement at the hour of operation. Nandan is a specialist in manufacturing of the telescopic conveyor which is used to load and unload trucks, 20' or 40' containers and large trailers. This versatile equipment designed with the ergonomics of operations in mind is a masterstroke requirement for the factories of all types which presently depend on manual labor. 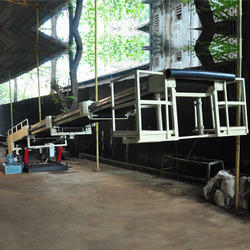 With the conveyor the automation can be achieved including package counting, RFID tags, barcoded dispatch, etc. The loading of the baggage into the aircraft is achieved using Nandan’s Baggage Conveyor (Roller track or Conveyor Belt Loader) which is available in towable as well as mobile versions. Ergonomic design provides maximum driver comfort, simple controls and excellent visibility whereas hydraulically operated belt drives as well as diesel engine operated hydraulic pumps make this versatile equipment. Towable Conveyor – This has range from 1200mm to 3400mm and is mounted on a trolley frame with solid rubber tyres and a sturdy diesel engine to run it.